Firefighters comb for clues through the rubble that was John John’s Auto Parts, after it was destroyed by fire on Wednesday night. 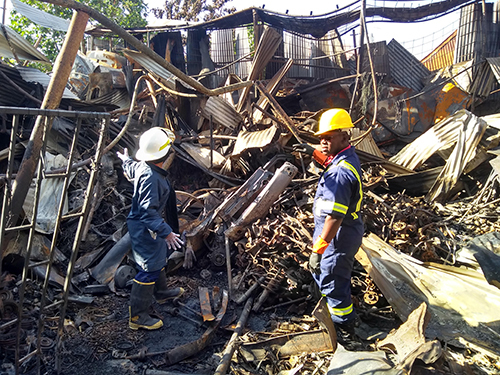 A fire that lit up the night sky on Wednesday in Montego Bay had disastrous effects for a number of residents and commercial structures along Hart Street, resulting in over 55 million dollars in losses for one establishment. The fire, for which the cause is yet to be determined, destroyed John John’s Auto, a section of Duggie’s Meat Mart, and completely gutted a house that was to the rear of the meat shop. Though reports are that no one was injured in the massive inferno, four persons were left homeless as a result of it. 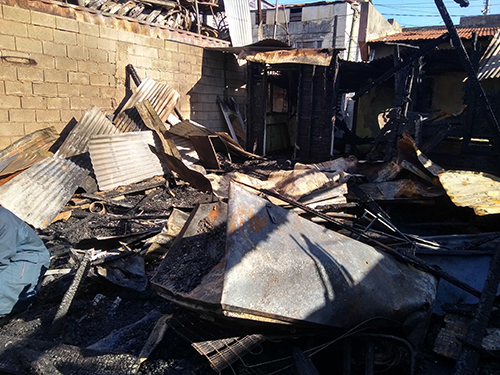 The back section of Duggie’s Meat Mart, pictured here in the aftermath of Wednesday’s massive blaze. The fire is said to have started minutes to twelve in the house and quickly spread throughout the building. Preliminary investigations revealed that fire’s rapid spread was aided by the house’s board construction. Residents were unable to save any valuable from the blaze. It later spread to the meat mart, completely devouring its board portion, before stalling when it came in contact with the concrete portion of that establishment. John John’s Auto proved not to be as fortunate though, as the fire, which was next door to the popular auto parts store, completely bypassed the dividing wall. Firefighters theorize that the flames and intense heat, after making it over and through the wall, ignited some of the auto parts that were atop a container, and eventually spread throughout the building. What remains now of John John’s Auto are just the charred remnants of once viable parts, now completely useless as a result of the fire. Firefighters were quick on the scene after receiving the call at 11:55p.m., and responded with three units from the St James division. It is reported that upon arrival, they were greeted with a massive blaze. An operation was quickly undertaken and using four jets, the blaze was brought under control. That four-hour ordeal by the firefighters ensured that the fire did not spread to other adjoining properties. 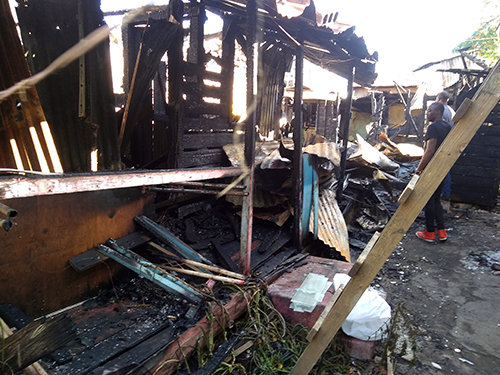 While fire investigators revealed that it is too early to establish the fire’s direct cause, they are exploring a number of clues to aid them in fast tracking that process. Residents, however, have posited their own theories as to the cause of the destructive inferno. According to some, there was a power outage sometime before the blaze, which they are speculating could have contributed to the fire’s origin. Other residents suspect that the fire could have been deliberate, despite offering no conclusive evidence to support that theory. The house where the fire started was also destroyed. The fire department has disclosed that in short order, they should be able to provide an update on the cause of the fire. It is uncertain if any of the affected properties were insured.